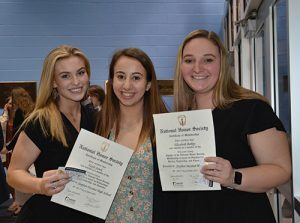 Eighty-three Stephen Decatur High School students were inducted into the National Honor Society during its special candlelit ceremony on the evening of April 3. To gain admittance, students must satisfy the four principles of the organization — character, scholarship, leadership, and service. United States Air Force Captain James Simons, SDHS class of 2009, served as guest speaker. Above, member Karla Bonilla, center, is pictured with new junior inductees Kayla Janek and Elizabeth Berkey.